A magnificent pair of Empire gilt and patinated bronze five-light candelabra ‘Retour d'Egypte’ attributed to Pierre-Philippe Thomire after a design by Charles Percier, each surmounted by a central upright and three trumpet-shaped branched candle holders chased with anthemions, rosettes and mythical birds and animals, issuing from monstrous bull heads upon a vase-shaped shaft chased with classical musicians and topped with a cat, supported on the head of an upright standing Egyptian female figure wearing a falcon head-dress over a wig of ringlets, a wesekh collar, her sheath gown secured below her breasts by a girdle from which suspends a long thin panel chased with pseudo hieroglyphs, holding in each hand a gilt fasces issuing a serpent holding in its open mouth a single vase-shaped nozzle chased with alternate anthemion and stars, the bare-footed figure standing on a gilt and patinated spreading rectangular plinth chased at the front with a dog-headed monster squatting on a bull and at the sides with pairs of kneeling Egyptian figures surmounted by a cat, on a rectangular base. These stunning candelabra are based on a design by Charles Percier (1764-1838). Similar caryatid figures appear in a pen and ink and watercolour sketch of circa 1800 by Percier as a support for a console table in the Egyptian taste. Percier also used similar figures in his "Recueil de Décorations Intérieurs", 1801, pl. XXXII. It is likely however that the model for these Egyptian caryatid candelabra date slightly earlier and may have been made for the celebrated Parisian marchand-mercier Martin-Eloi Lignereux (d. 1809) of rue Taitbout, whose business was purchased by Pierre-Philippe Thomire in 1804. A comparable pair of candelabra by Thomire (with similar supporting figures with two tiers of branches but without candle branches in each hand) were supplied in the late 1790's to Czar Paul I (Pavlovsk Palace, Saint-Petersburg), while another from the H. de Givenchy collection were sold in Monaco 1993. King Louis-Philippe of France also owned a similar pair at Château de Saint-Cloud. They were obviously favorite items since they are listed in 1828 and in later inventories of his personal apartments and then at Château de Compiègne. In 1909 they were moved into storage at the Hôtel de Salm in the Grande Chancellerie de la Légion d'Honneur, Paris where they remain today. The present pair is extremely rare. Unlike the aforementioned examples these Egyptian figures hold in each hand a fasces candle branch in place of a palm frond and lotus leaf. In this they are almost identical to three other known examples (with additional surmounting seated cat and birds). One pair was owned by Prince Anatole Demidoff (1813-70) and was included in the sale of his great art collection at Villa Demidoff de San Donato, Florence in March 1880. Another almost identical pair was previously owned by Edward Medlicott Esq, Sacombe Park near Ware in Hertfordshire and a third pair was once in the Freitherrn von Heylisches, Schloss Hernnschein collection. 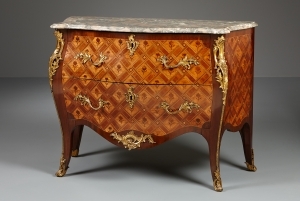 The attribution to Thomire is strengthened by the fact that in 1806 Thomire delivered a console table featuring similar Egyptian caryatids based on Percier's design to the residence of Consul Charles-François Lebrun (now in the Grand Trianon, Versailles). In 1812 Thomire and his associate Duterme delivered another console table with identical bronze caryatid supports to the Garde-Meuble, which is also now in the Grand Trianon, (see; Denise Ledoux-Lebard, "Inventaire Général du Musée National de Versailles et des Trianons", vol. I, "Le Grand Trianon, Meubles et Objets d'Art", pp. 20-21). Up until 1806 Lignereux owned the copyright for these particular models despite the fact that Thomire had already purchased his business two years earlier and was producing candelabra with similar figures well before this date. Other related models sold by Lignereux included candelabra with the arms of the Egyptian figures entwined with serpents, of which he sold one pair to Thomas Bruce, 7th Earl of Elgin in 1803. Elgin had been returning home via France to Scotland with the Parthenon marbles but was placed under house arrest in Paris. While there he began collecting paintings, furniture and works of art. Many of these items, including the Egyptian candelabra, were purchased from Lignereux's prestigious showrooms. Charles Percier's design for this particular caryatid Egyptian female was evidently so popular that it was realized in media other than bronze. For instance almost identical figures were made as gilt painted biscuit figures by the Paris Porcelain Manufactures, possibly by Guéhard et Dihl or Caron et Lefebvre, (e.g. Christie's New York, 26th Oct 2001, lot 377). The vogue for Egyptian styled objects and decoration, which began during the mid-eighteenth century gained increasing momentum after Napoleon's Egyptian campaign of 1798 and soon manifest itself in all manner of the arts, from candelabra and clocks, to furniture and figurines. Percier's design was not based on any exact prototype although the original spirit of Egyptian sculpture is clearly evident. His design and Thomire's supreme skill in rendering it in bronze remains an important legacy from the Empire period. Hans Ottomeyer and Peter Pröschel, "Vergoldete Bronzen", 1986, p. 336, pl. 5.3.4, illustrating a design in the Musée du Louvre, Paris by Charles Percier, circa 1800 for a very similar Egyptian caryatid support for a console; and p. 336, pl. 5.3.3, illustrating a very similar but simpler candelabra by Pierre-Philippe Thomire, examples of which can be found at Pavlovsk Palace, Saint-Petersburg and the Grande Chancellerie de la Légion d'Honneur, Paris.